This box set is a class act. The whole thing comes in something that resembles a book. Five CDs contain lots of classic Yes and some songs that were never before officially released. The book that comes with is quite nice, too. It should be mentioned that the inclusion of Anderson Bruford Wakeman and Howe material might seem a bit odd, considering how hard the Chris Squire version of the band fought to keep ABW and H from using the name Yes, now these songs are released under that banner. Still, the material is very much Yes music, so it should be here. Collectors will love the inclusion of the lost sessions from the time before Rick Wakeman and Jon Anderson left post Tormato. While some better notes on the songs would have been nice, this is a great set and a great package. Since I’ve reviewed most of the songs previously on their original albums, I’ve adapted the track by track reviews here from those for the sake of consistency. A Beatles cover, Yes starts this with a free form jam that at times is quite frantic and hard edged. They eventually drop to the main melody line, throwing in the familiar "Day Tripper" riff for good measure. Yes' take on this one is both reverent and experimental, showing that a true pop classic can be taken to new experimental heights. It gets a bit weird at times. 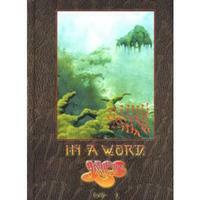 This came from Yes’ self-titled debut. A mellow balladic cut, this is also from the first album. It is a bit more rock and roll and run of the mill than most older Yes, but still holds up remarkably well. Chris Squire's bass work adds a lot of character to this one. One of the highlights of the first Yes album, this begins with some almost funky guitar that gives way to another free form jam that the band seemed so fond of in those days. This eventually works through, then gives way to a balladic segment that serves as the bulk of the piece. During the lyrics Anderson sing, "the beginning of things to come,” and these words seem truly prophetic on this cut. This is a definite strong point, and has weathered the years quite well. A descending progression begins this, then a tentative jam with lots of kinetic energy takes it. As this runs through the vocals come in over top. The lyrics on this one are particularly potent. The chorus is a satisfying resolution out of the tension created by the verse segment, and the strings are especially effective on this number. "Love is the only answer / Hate is the root of cancer, then.” This cut takes a seemingly deceptively complex arrangement and makes it seem simple and catchy. The band eventually moves this into a fast paced instrumental break that features a lot of soloing by Tony Kaye. This musical excursion seems to be Yes' answer to Vanilla Fudge in many ways. At the end of this they drop it way down to a very atmospheric sort of segment that gains as much from what isn't there as it does from the sounds that are - the space between is enchanting. Both Squire and Banks move subtly around in this segment, bringing a lot of style to it by playing just the right thing, and never too much. A quick flourish ends the piece. This was originally released on Time and A Word. Although this one is a bit more familiar to Yes fans, than much of the material on Time and A Word, its fairly straightforward Beatlesish song structure is just not that special. Although catchy, this is one of the weaker tracks on that disc, gaining much of its appeal, I believe, from the repetition awarded it from its presence on Yesterdays. This is another of the better-known cuts from the Time and a Word album. It is a fairly strong fast paced early prog cut with definite psychedelic leanings. The instrumental break on this one features some of the most classic Yes oriented instrumentation on that whole album, and the build up that follows, along with its guitar solo, are spectacular. This one is truly awesome, and Squire, Banks and Bruford all are on fire at different points in this number. This must have come from the sessions for Time and A Word, as it features the string section that was used for that recording. It is a strong, if fairly straightforward number that feels sort of like a combination of the Beatles influenced pop rock style that that band were so fond of, and the type of arrangements that they would later embrace with albums like Fragile. This is actually stronger than some of the material that did make that album, and I wonder why it was chosen to be left off. It features a great vocal arrangement. This acoustic guitar solo is recorded live. It’s a bouncy number that’s just plain fun. Yet, it’s also quite intricate. Although, it’s listed as being from The Yes Album, this recording seems a bit different, or at least extended in terms of the spoken introduction. This title track starts slowly with the simulated sounds of birds and water gradually building and swirling courtesy of Rick Wakeman's keyboards. As this crescendos, the band comes in with a frantic and chaotic series of counterpoints dancing circles around one another. The result is somewhat hard to take at first, but really does feel a bit like a harder edged take on something from Fragile. As this carries forward, it is punctuated at a couple points by non-lyrical vocals. Eventually all this resolves down to a more melodic verse segment taking the song to its next movement. The cut runs quite a while working through and reinventing several musical and vocal themes. Eventually it drops to an atmospheric section and gradually begins a building process from there. This segment is highlighted by sort of a vocal duel between Anderson and Squire. The lines the two sing don't seem really related to one another, but almost as if both are singing two different, but complimentary songs. As this movement peaks, Wakeman takes over once more. He switches to synthesizer to re-energize the cut and move it to the next fast paced segment. This section moves and evolves, eventually returning to a chorus of "I Get Up/I Get Down" which is a reprise from earlier points in the composition. That chorus moves the piece to the dramatic resolution followed by Wakeman's keys in similar tones to the intro serving as bookends to the epic. This one jumps right in with vocals right at the start accompanied by atmospheric music. It starts a slow and gradual, but steady building process from this pint, eventually working up a lot of drama and tension. As this segment resolves, a new melody line, driven at first by the keyboards, takes it. Howe manages some strong soloing here. The band make their way through several reworkings of this theme, eventually giving way to the next verse section. This segment is overlaid with a lot of guitar riffing, even as the vocals carry forward. They continue in this general pattern for quite some time. One of the better vocal segments of the Tales from Topographic Oceans disc eventually comes in here. After they carry through on this for a time, a highly dramatic and hard-edged jam takes over. This is one of the more effective segments of the entire Tales from Topographic Oceans album. It gives way to a slower, more harmonious rather balladic section. This movement drops away and a keyboard segment, quite powerful and pretty, takes it. After Steve Howe uses this as a backdrop for some meaty guitar work, the band moves it into a dramatic vocal section. The lines this time are punctuated by some tasty instrumental work. The riffing in this section is especially effective. This shifts to a fast-paced classic Yes type section that works very well. This resolves into a triumphant segment, then gives way to a frantic jam, one of the coolest of the whole package. They eventually move this out to balladic melody segment that feels a bit mysterious and quite powerful. Then a different, sparse arrangement forms the basis for the next vocalizations. This gives way, eventually, to a new instrumental exploration that includes some great keyboard textures. Anderson adds non-lyrical vocals here, acting as an instrument with the rest of the group as they make their way across the soundscape. This is truly one of my favorite parts of the album from which it originally sprang, but it doesn't last long. They drop it to atmospheric textures that serve backing to the next vocal segment. This gradual builds up in organic ways to the melody that ends the cut. Coming from Relayer, a fairly melodic arrangement, based firmly on Howe's guitar work begins this. Eventually, this gives way to the first melodic segment of the song. Still, Howe is ripping all over this. The cut carries through this segment until a new movement feeling rather peaceful takes it for a time. It then returns to the previous stylings. The cut is quite frantic and high energy here. An instrumental interlude takes it, moving the melody line forward. A mellower chorus enters, then is reborn with a higher energy level before an all new jam based on familiar themes takes over. This evolves into quite a hard-edged element. Then the real chaos takes over, the band becoming a rather noisy rock and roll symphony. Then it explodes in frantic prog jamming that simulates the chaotic furor of war very well. This gets very raucous at times, and one can really picture the violent clash of two armies reflected in this musical segment. This makes several left turns as it carries on, bordering on noise at times. One can hear the crashing of metal against metal and guitar screams. Howe puts in some of his crunchiest work ever here and noisy keyboard textures overlay. This whole segment is truly chaotic. It crescendos, then more musical elements take over. This winds its way through, then drops to ambience. From that backdrop a new melody, gentle and rather pretty, takes over. This represents the next vocal segment, and it quite poignant, the peace after the horrors of war. The lyrics portray a vision of hope amongst the madness. Howe works some stunningly beautiful slide guitar over top of the melody here. This works through to a satisfying resolution. From the same album as the previous piece, this is a mellow balladic number. It doesn't change around too much, but the consistency is a welcome relief from that chaos that makes up the vast majority of the Relayer album. Beautiful acoustic guitar and vocal interplay makes up the early segments of this composition. Together they weave their tale of beauty until the other instruments begin to join, carrying on with building. This song is a work of splendor. It features a complex arrangement. This is an example of some of prog's finest. "Did her eyes at the turn of the century, Tell me plainly when we meet how we'll look, As we smile time will leave me clearly". Beautiful and intricate acoustic guitar ends the piece. This was originally released on Going for the One. Yes' take on heavy metal, this is a very hard rocking number with a driving beat. Still, it features many quirky changes to make it trademark Yes. In fact, it evolves into very strong prog jamming. It was originally released on the same album as the previous number. Based on somewhat silly lyrical subject matter, this Tormato number is nevertheless a quirky little prog rock number. It really explodes toward the end in a progressive rock jam that simply keeps reinventing itself. This song was originally recorded when the band were working on the follow up to Tormato. Before that album was finished, Rick Wakeman and Jon Anderson had both left the band. So, this (and the first songs of the next disc) were never completely finished or released (until now). This is very much in a style that seems to combine Jon Anderson’s Olias of Sunhillow with Yes’ Tormato album. It’s pretty complex and quite tasty. It’s actually a great piece of music. Here’s another song from those lost sessions for what would have been the follow up to Tormato. A bouncy sort of build up leads to Anderson’s first vocal appearance on the track. The arrangement is quite sparse for those first verses. Gradually more elements are added to the mix. When the arrangement turns more lush later and they take us through a couple short twists, this song is simply incredible. The production isn’t quite up to the par that it would have been had they completed this, but the music is strong enough to make up for that weakness. Another number from those same lost sessions, this one’s not as strong as the first two. It seems a bit like something from Jon Anderson’s solo career. That’s not really a bad thing, but it just seems a little pop-oriented for Yes. Still, there are a couple little bits of Steve Howe brilliance and Wakeman’s honky tonk piano is nice. It’s just kind of a simplistic number. There doesn’t seem to be information in the set about just where this song originated. It might be from those same post-Tormato sessions, but I’ve had a bootleg recording of those for years, and this wasn’t included. It seems to be a workup that features just Squire and Howe, so perhaps this was actually after Anderson and Wakeman had left. Either way, it’s interesting, but not all that special. Of course, it was certainly some kind of demo, so that’s to be expected. With the possible exception of the Trevor Rabin era, this cut (from Drama) is arguably the darkest and heaviest Yes have ever done. It starts with a very crunchy segment that gives way to a bouncy verse mode. After that segment the musicians take the opportunity to wander out in a prog musical excursion that is very tasty. When the verse section returns it is reworked and revitalized into a more powerful version. They move this into a major jam, with Howe's guitar simply screaming.. After another heavy segment the band pulls it back to a dramatic and sedate movement to carry on. The heaviness and frantic instrumental interplay returns after a time, the group pulling the cut back up. This epic is truly a great song, and could stand side by side with just about any other work in their catalog. Keys start this, and while Howe lays down a bouncy Police like rhythm guitar Squire's bass simply runs like crazy. This is definitely not your typical Yes music, but Squire and Howe are both on fire at times, and the general tone and quirky changes really do work. This one also came from Drama. This bouncy cut (from 90125) is a pretty straightforward rocker, but the vocal arrangement is its key redeeming factor. At times this one feels more like '80's hair metal than classic Yes. Of the singles from the Rabin era, this cut from Big Generator was always the one that grabbed me. It really seemed to work pretty well. It starts with a string section then moves to a strong guitar picking mode that serves as the basis for the chorus. The verse here is sung by Squire over an almost funky line. Like 90125's "Hearts" the closer to Big Generator is another cut that feels like an Anderson solo composition. It is another slowly building balladic number with its share of moments, it's just not all that special. An abbreviated version of this song from Anderson Bruford Wakeman and Howe was released as a single. The cut opens in the chorus and it’s the first melodic “song” based section we’ve heard by that point on the source album. After the chorus runs through they move through a number of alterations and variations. Howe solos here. This is the first time on the disc where he’s beaten Wakeman to the solo. Howe’s presence is more pronounced on this track and it’s one of the strongest cuts on the disc. There’s a rather Native American styled feeling to a lot of this. There’s a cool bouncing bridge later in the track. This resolves into a melodic breakdown and then Wakeman gets a solo segment. Howe lays lines of guitar soloing over the top after a time. A reprise of the “Nothing Can Come Between Us” section brings us back to the opening chorus section of the track. It resolves into a melodic solo from Steve Howe (multilayered at times). Just as it seems like this might bring us to the end of the track they move out into a killer staccato jam that calls to mind Close to the Edge era Yes. They don’t stay there long, though. Instead this gives way to the rather catchy “Brother of Mine” chorus. Lest you think you’ve found your way into a pop song, though, they shift this out into a powerful keyboard dominated instrumental segment for a time before returning to the chorus. Then this gives way to a more melodic section that calls to mind Anderson’s solo works. This gives way to another brief segment and then a return to dramatic jamming. Howe solos while Anderson is still singing. That’s always a huge plus for me. I’ve never liked the tendency (even in progressive rock these days) to sectionalize the instrumental soloing and vocals. To my ears it’s far more dramatic and powerful to have the solos taking place during vocal sections. In any event they bring in a keyboard solo alongside Anderson later and then resolve out into another killer prog jam that has a major emphasis on Wakeman’s keys. A classic closing jam (ala Fragile) takes the track out. This is an alternate version of a song from the Anderson Bruford Wakeman and Howe album. It’s quite a cool track. While the overall arrangement is rather stripped down, bits of guitar and keyboards play across the top at many points. Besides that, the general arrangement is just so dramatic and powerful. It’s catchy and powerful. It’s a great piece of music. After Anderson Bruford Wakeman and Howe did their touring, that group united with the other version of Yes and released Union, and this track is from that album. This cut from the ABWH camp is a cool heavy free form number with a great arrangement. It features some smoking guitar work. This wouldn't qualify as "classic Yes", but it's pretty darn good, feeling a bit like a cross between the styles the band did on Tormato and Drama. This one was the first song on Union to come from the Rabin incarnation of the group. For some reason this one comes across like a merging of the Rabin songwriting and the ABWH sound. It's actually one of the stronger numbers on that album. Another from Talk, this one has all the textures of Trevor Rabin's solo work, mildly creative and entertaining arena rock, but certainly not worthy of the Yes moniker. Coming from Keys to Ascension 2, this was one of five studio tracks recorded by the reunited classic Yes lineup of Anderson, Howe, Squire, Wakeman and White. The intro to this song is rather reminiscent of Tales From Topographic Oceans, but as it builds it breaks into new musical ground, while still maintaining a definite Classic Yes feel. I really felt at first that the chorus section really didn`t fit this song, but now I have grown to see that it does fit. However, it still seems to mar the continuity a bit by repeatedly bringing a song that seems to be building well back down. Just seems kind of unsatisfactory from a dramatic point of view to me. There is an acoustic break which reminds me a lot of Peter Banks` style of playing, then it breaks into a nice instrumental section, much in the vein of Close to the Edge, although, perhaps a bit jazzier at times. The mood of the end of the song is quite nice. Another from Open Your Eyes, this track is very good. It starts with some wonderful (and rather intricate) acoustic guitar work, and actually seems to have a Going For The One sort of feel in places. The song contains a very nice guitar break that is followed by a section that harkens to Jon Anderson`s solo material. A very funky/bluesy intro segment gets this one off in fine order. Then, the first verse comes in in an emotional classic Yes mode. A triumphant buildup then takes the piece. The choruses are quite catchy, but still very prog oriented. The cut features a bluesy acoustic solo and a considerably strong instrumental movement. It shift gears after a time, moving into a dramatic TFTO oriented mode. This cut is really classic Yes brought into the new millennium in high fashion. It originally came from The Ladder. This bouncy little rocker is fun, but a bit odd. It’s obviously some sort of demo. It’s mostly just bass guitar, drums and vocals. That bass really screams, though. It’s cool to hear Anderson do a bluesy rock performance. Beginning with drummer Alan White tickling the ivories, Anderson joins and a tender balladic form takes over. Don't get too comfortable, though, as this is just the first segment. They build on this for a time, then a more rocking variant of the melodic theme emerges, and it begins to feel like something from the Anderson Bruford Wakeman and Howe era. Just when the listener is used to this, an instrumental break heralds in a new section. This one is a fairly mellow building that just feels ready to explode. It is a very dramatic section. Howe puts in some fine work here. Even earlier themes of the cut return and it has yet to find its final theme. As it does enter that mode, Squire's bass is the catalyst, reworking the theme from the previous movement, heralding more dramatic things to come. And, dramatic is right! This movement builds slowly as a fruition of a promise and it does deliver. This is a very strong track that comes from Magnification.